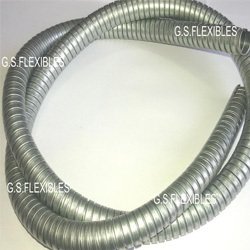 GSF Double Interlock GI Flexible Conduit is most rugged & sturdy flexible armouring conduit available. It has fully interlocked formation i.e. adjacent strips are completely folded and locked into each other. It had remarkable strength against axial elongation, crush and bend fracture. It has moderate to high flexibility. It is most suitable for applications where extreme performance is required. GSF Double Interlock GI Flexible Conduit is specifically designed for extreme performance in very demanding applications. It is most suited for automobile, electric panels and heavy industry.. It offers excellent crush resistance and protection against accidental axial elongation. Its smooth interiors, easy installation and cost-effectiveness make it ideal armouring conduit. For sophisticated electronic equipment, please consider our SS Flexible Conduit. Custom sizes and formation types are available upon request.